It’s become a little bit of a joke between Suzanne and myself that when our daughter starts going to playgrounds, Suzanne is going to either make her wear a helmet or be following after her with Neosporin and a Band-Aid. I’m under the impression that kids need to get their bumps and bruises because it’s part of growing up. The way you bounce back from injury — whether it’s a raspberry or a broken arm — builds character. You’re not really ready to have those thoughts fully developed when your daughter is three days past seven months. We got a glimpse of Ella’s future this morning. She’s either going to be a skydiver or a rock star who is fond of stage diving. Ella fell off the bed this morning. We have hardwood floors. This is not a good combination. 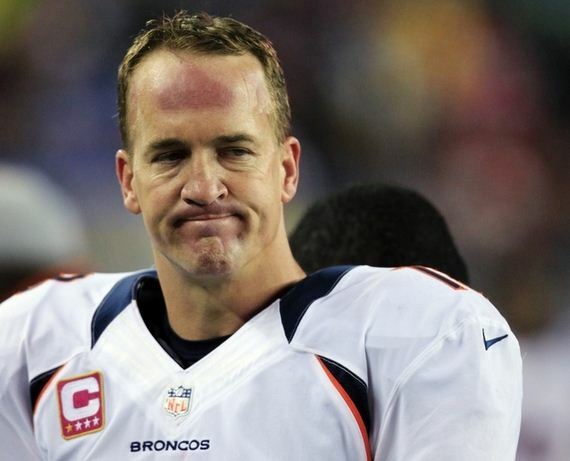 Now her forehead looks like Peyton Manning’s after he takes his helmet off. Ella had a nice spot on her head like this guy. I was on my way to work. Suzanne called and was in tears. This was after a text and a call to the doctor’s office. You see, she did the right thing, putting a pillow around Ella while she was getting ready for work. On top of that Suzanne even put a pillow on the floor towards the side Ella favors as she rolls. Ahh, kids, they’ll throw you for a loop. This stinkin’ baby of ours rolled across the bed and then — boom! — onto the floor, testing Isaac Newton’s gravitational laws. Now I felt like the panicked parent two steps behind my kid at the playground, but I had to play it cool because I was already at work and was just getting information between texts and phone calls. Because a baby’s head is still so tender and soft I kept worrying that Ella basically fell on her brain. But, because a baby’s skull is still like a soft shell crab’s at a sushi bar, she didn’t even have a knot on her head. Just a little scrape and a small bruise. Nature … isn’t it crazy? Suzanne: I just feel like such an a-hole. Me: The good thing is she won’t remember. Suzanne: Thanks honey…that makes me feel better. Me: We can have a strong cocktail together when we get home to ease your worries. Suzanne: Just tell me I’m not a bad mom and that accidents happen. Stiff cocktail wouldn’t hurt later. 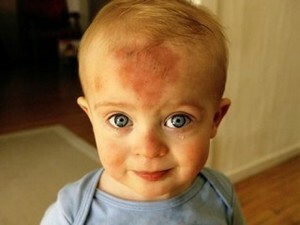 If you Google image search “baby falls off bed” this is like the fourth picture. Thankfully Ella’s head is not nearly this bad. Suzanne is a great mom. Who thinks to even put a pillow on the floor just in case the baby rolls out of bed? Problem was, Ella found the other side of the queen after a couple of gator rolls. What we found out today tested my theory a little bit — Ella is still smiling and having fun and bouncing around, so the fall gave her a bruise, but she popped back up and built some character. We also found out that she is going to be like both of her parents: a little hard-headed.